A cyber attack campaign, dubbed #OpIsrael by hacking group Anonymous, targeting Israeli websites caused massive disruption to government, academic and private sites Sunday. Israeli media said small business had been targeted. Some homepage messages were replaced with anti-Israel slogans. Anonymous threatened to disrupt and erase Israel from cyberspace in protest over its mistreatment of Palestinians. In response to the eight day assault that killed 133 Palestinians, Anonymous defaced thousands of Israeli sites and provided information for Gazans facing Internet and communications blackouts. 60 million hacking attempts were reportedly made. Most of the attacks have had little impact, and Israeli experts even say they welcome the attempts as ways of sharpening their defenses. Israel itself is accused of taking part in much more sophisticated cyber attacks against its enemies, particularly Iran. The hackers also released a list of email addresses and credit card numbers, reportedly lifted from the online catalog of Israel Military, a privately-owned business that sells military surplus. Some 700 Israeli website suffered repeated DDos attack, which targeted high-profile government systems such as the Foreign Ministry, the Bank of Jerusalem, the Israeli Defence Ministry, the IDF blog, and the Israeli President's official website. 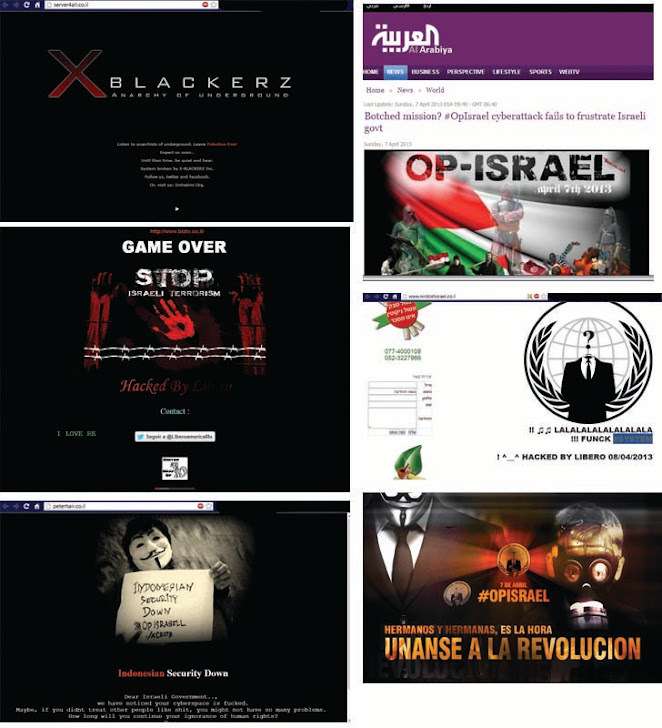 Hackers have tried before to topple Israeli sites, with limited success. This is the second cyber attack on Israel allegedly launched by Anonymous.